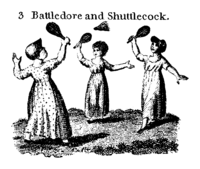 Battledore and shuttlecock, or jeu de volant, is an early game related to that of modern badminton. This game is played by two people, using small rackets, called battledores, made of parchment or rows of gut stretched across wooden frames, and shuttlecocks, made of a base of some light material, such as cork, with trimmed feathers fixed around the top. The object is for players to bat the shuttlecock from one to the other as many times as possible without allowing it to fall to the ground. Games with a shuttlecock are believed to have originated about 2,000 years ago, and it has been popular in India, China, Japan, and Siam for at least that long. In Europe, it was played by children for centuries. Its modern development is the game of badminton. ^ a b One or more of the preceding sentences incorporates text from a publication now in the public domain: Chisholm, Hugh, ed. (1911). "Battledore and Shuttlecock" . Encyclopædia Britannica. 3 (11th ed.). Cambridge University Press. p. 534. This page was last edited on 17 October 2018, at 19:46 (UTC).